Join local Stampin' Up demonstrator, Kerrie Zeuch for a Holiday Card Making workshop. Participants will get creative tips and ideas for making the perfect Holiday Cards. Each participant will create 2 holiday cards and multiple holiday gift tags during this 2 hour workshop. This workshop is FREE but registration is required. Call 419-468-3203 to register. Tue, Nov 1st, 6-8pm. Griff, an American Labrador Retriever, is a trained therapy dog as part of Therapy Dog International's Tail Waggin' Tutors program, and he listens to boys and girls read books. He'll be here on Wednesdays from 5-6pm starting September 7th 14th. Studies show that therapy dogs calm students so that they can practice, gain confidence, and improve their skills in a relaxing environment. Parents can sign their children up for a ten-minute session of reading with Griff. Join us for activities based on the Caldecott Award winning book The Invention of Hugo Cabret , by Brian Selznick. Create your own clock and a special notebook to take home. For grades 3-6. There is no charge for this event, but registration is required. Sat, Nov 19th, 2-4pm. Join us for music, refreshments, storytimes, and children's crafts. The wish tree will be up. Our open house this year will coincide with the community's Come Home to Galion celebration. The music will start promptly at 1pm with Galion High School's Showtunes choir. The special Holiday Story Times will be at 1:20 and 2:10pm. There will also be carriage rides. Sat, Dec 3rd, 1-3pm. New to using e-books and e-readers? Join Director, Vicki Eckenrod and Technology Specialist, Nathan Eady of the Galion Public Library for this instructional session offering hands-on training. Participants will be instructed on how to utilize Galion Public Library's e-book lending program, OverDrive. All patrons have access to the e-book collection starting Monday, December 5, 2011. Thu, Dec 8th, 6-8pm. The library will close at 5pm the night before Thanksgiving. Wed, Nov 23rd. Join us for a special viewing of an animated feature film. Bring a pillow and blanket if you wish. We'll supply the popcorn. For grades K-6. There is no charge for this event, but registration is required. Stop by the library to find out what movie we'll be showing. Fri, Dec 23rd, 2-4pm. Coming up in January. For grades 7-12. Watch this space for the exact date and more details. Do you have the desire to blog? Want to learn how to share your daily stories and insights with your friends and family far and near? This workshop is for you. Create Your Own Blog will be lead by Rachel Mendell and Marcheta Gibson. We will use our laptop lab and by the end of class you will have your own blog. Limited availability. Call today to register! 419-468-3203 Sat, Nov 19th, 10-Noon. The library will be closed in observance of the holiday. We will also close at 5pm the evening before Thanksgiving. Join our lively book discussions. Contact Cyndi for details. The chess club is the longest-running teen program at the library. Whatever your skill level, join our ongoing ladder tournament and find out which rung you will dominate. Japanese culture, films, and manga. For teens in grades 7-12 only. The Friends of the Library meets at the library on the first Tuesday each month. Our annual Gingerbread House contest is back! Gingerbread houses this year can be constructed out of any edible ingredient (not only from gingerbread). Entries will be judged in three categories: 12 and under, 13 and up, and groups. In addition to the first and second place prizes for each age group, we will also be having a grand prize for Best in Show. 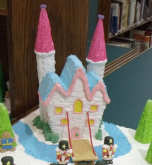 Gingerbread houses should be brought to the library during the week of November 28th. Your creation will be put on display at the library. Patrons will be encouraged to visit the library and vote for their favorite house during the week. Judging will take place on December 3rd. Contestants do not need to be present to win. Sat, Dec 3rd. Get hands-on experience using Windows 7 to manage tasks on the computer. Start programs, switch between windows, minimize, maximize, resize, customize, and more. Mon, Jan 30th, 5:30-8pm. Come out of the cold and get some FREE Dunkin Donuts Coffee! The free coffee is yours as a thank you for your blood donation to the American Red Cross. Come make the holiday a little brighter for someone in need! Wed, Dec 28th, Noon-6pm. Do you have a Point and Shoot camera that you're not sure how to use? Join photography expert, Marcheta Gibson, for her get-to-know-your-camera class. Bring your camera and your manual in order to take full advantage of her expertise. Sat, Jan 7th, 10-Noon. Do you have an SLR camera that you're not sure how to use? Join photography expert, Marcheta Gibson, for her get-to-know-your-camera class. Bring your camera and your manual in order to take full advantage of her expertise. Sat, Jan 14th, 10-Noon.